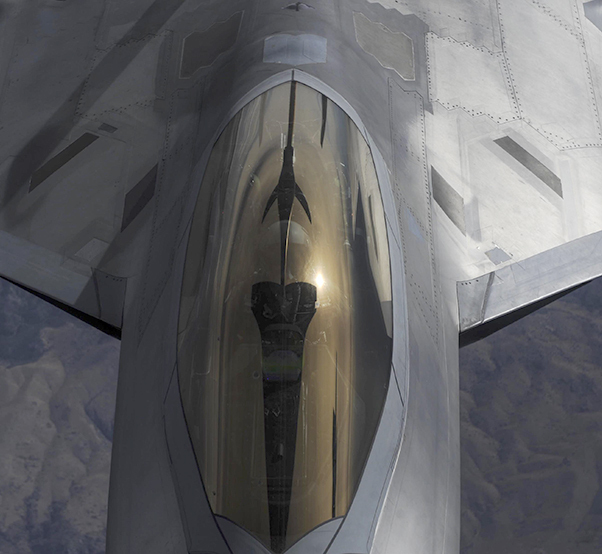 An F-22 Raptor fighter jets, assigned to the 433rd Weapons Squadron, at Nellis Air Force Base, Nevada, banks and flies over the Nevada Test and Training Range July 10, 2017. 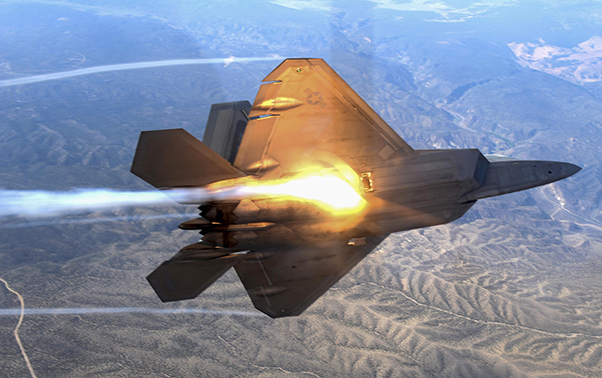 The United States Air Force Weapons School teaches graduate-level instructor courses that provide the world’s most advanced training in weapons and tactics employment to officers of the combat air forces and mobility air forces. F-35 Lightning II fighter jets, assigned to the 6th Weapons Squadron, at Nellis Air Force Base, Nev., fly in formation over the Nevada Test and Training Range, Nev., July 10, 2017. An F-15 fighter jet, assigned to the 433rd Weapons Squadron, at Nellis Air Force Base, prepares for aerial refueling over the Nevada Test and Training Range, Nev., July 10, 2017. 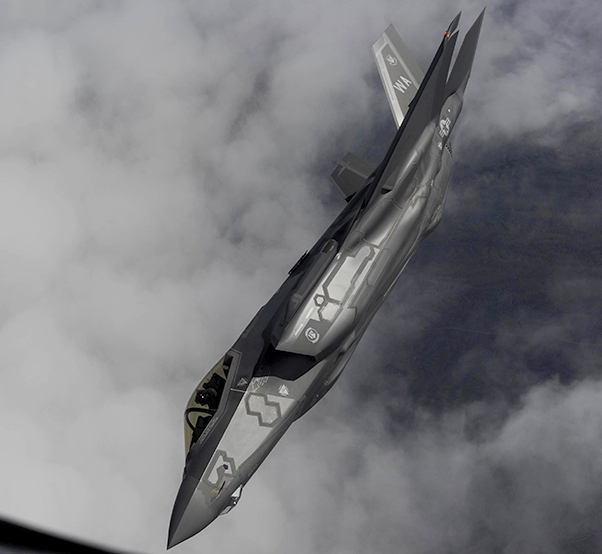 An F-35 Lightning II fighter jet, assigned to the 6th Weapons Squadron, at Nellis Air Force Base, Nev., flies over the Nevada Test and Training Range, Nev., July 10, 2017. 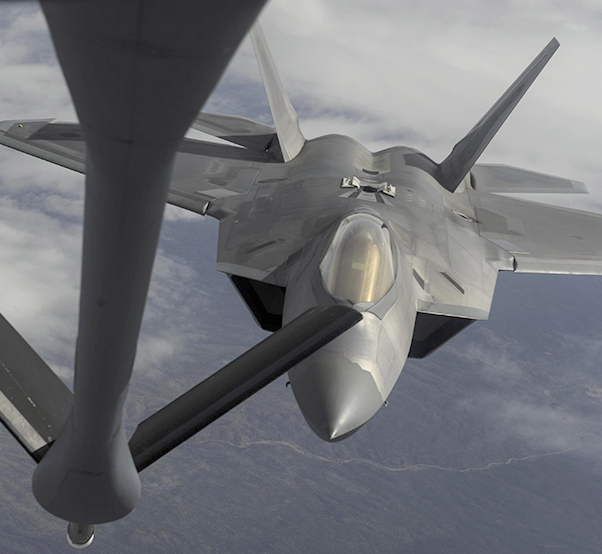 An F-22 Raptor fighter jet, assigned to the 433rd Weapons Squadron, at Nellis Air Force Base, flies to meet a KC-135 Stratotanker cargo aircraft assigned to the 509th Weapons Squadron, Fairchild Air Force Base, Washington, boom for aerial refueling over the Nevada Test and Training Range, Nev., July 10, 2017. 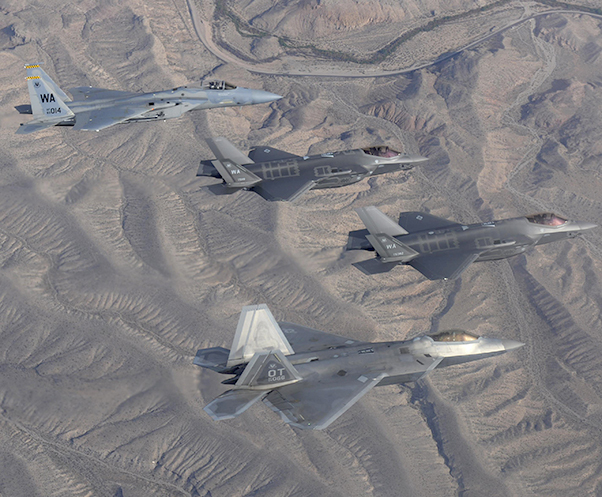 An F-35 Lightning II, assigned to the 6th Weapons Squadron, at Nellis Air Force Base, Nevada, F-22 Raptor and an F-15 fighter jets, assigned to the 433rd Weapons Squadron, at Nellis Air Force Base, Nevada, fly in formation over the Nevada Test and Training Range July 10, 2017. An F-15 fighter jet, assigned to the 433rd Weapons Squadron, at Nellis Air Force Base, Nevada, prepares for aerial refueling over the Nevada Test and Training Range, Nev., July 10, 2017. 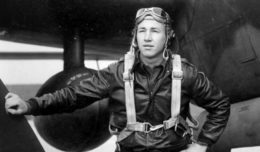 The United States Air Force Weapons School teaches graduate-level instructor courses that provide the world’s most advanced training in weapons and tactics employment to officers of the combat air forces and mobility air forces. 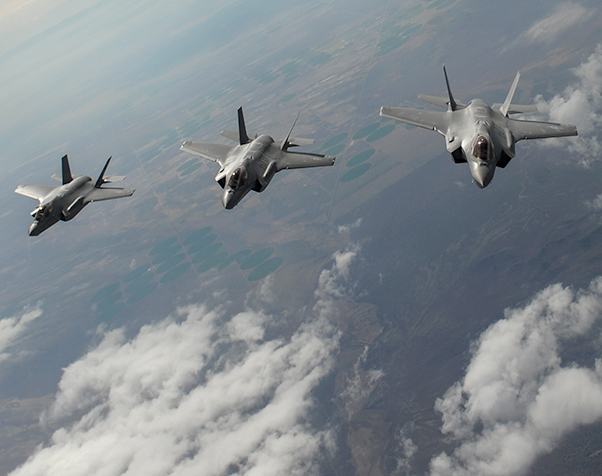 F-35 Lightning II fighter jets, assigned to the 6th Weapons Squadron, at Nellis Air Force Base, Nev., fly in formation over the Nevada Test and Training Range, Nev., July 10, 2017. 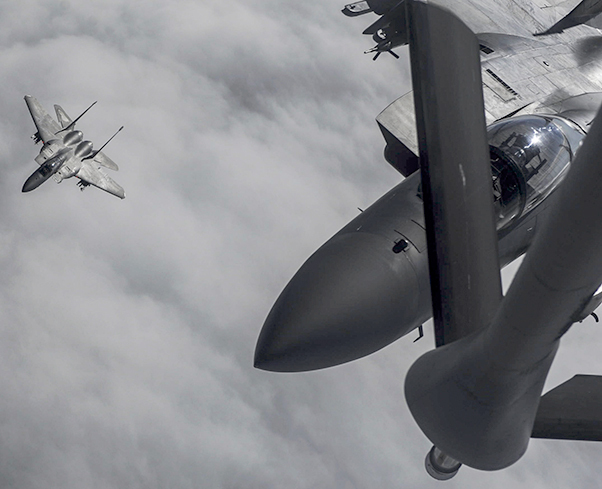 The United States Air Force Weapons School teaches graduate-level instructor courses that provide the world’s most advanced training in weapons and tactics employment to officers of the combat air forces and mobility air forces. 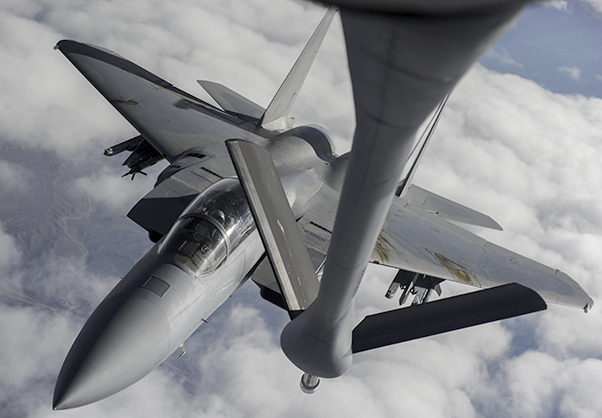 An F-15 fighter jet, assigned to the 433rd Weapons Squadron, at Nellis Air Force Base, Nevada, receives aerial refueling from a KC-135 Stratotanker cargo aircraft assigned to the 509th Weapons Squadron, at Fairchild Air Force Base, Washington, over the Nevada Test and Training Range July 10, 2017. 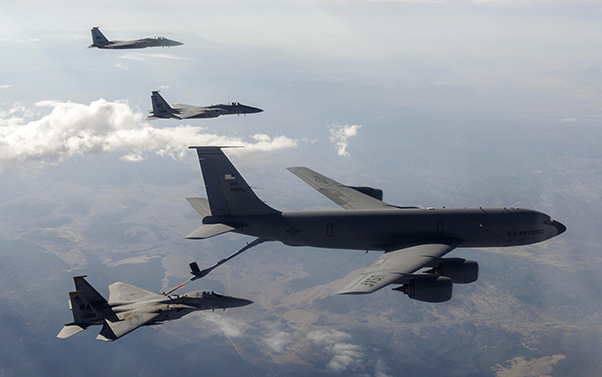 The United States Air Force Weapons School teaches graduate-level instructor courses that provide the world’s most advanced training in weapons and tactics employment to officers of the combat air forces and mobility air forces.